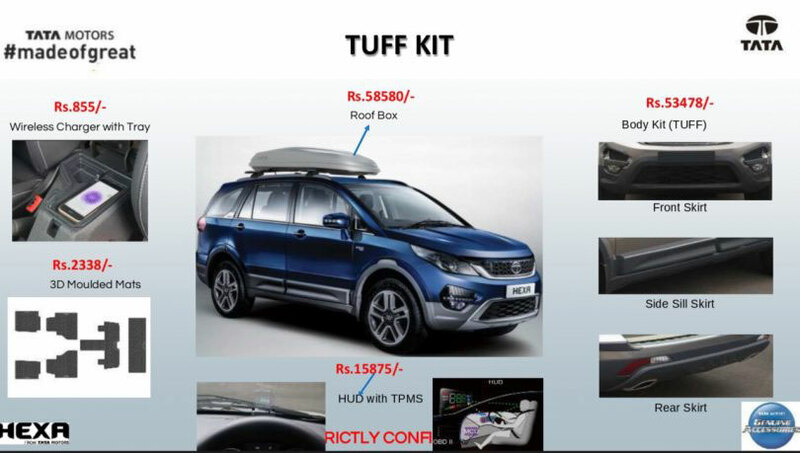 Even before the official launch of Tata Hexa which is scheduled to happen on January 18th, details about the Tata Hexa customisation kits / accessories have surfaced online. In order to cater to customer’s preferences, Tata Motors will be providing bundle of customisation options through individual accessories and kits. 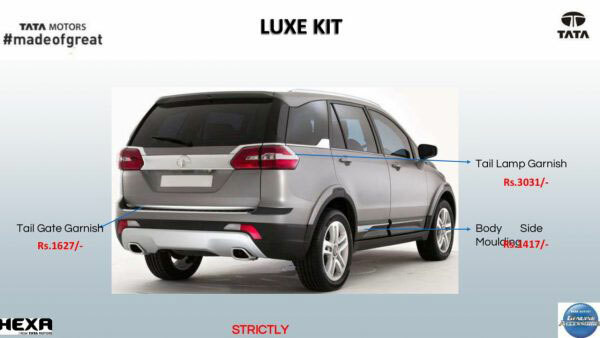 As per the leaked details available, Tata Hexa will offer three customisation kits: Tuff, Luxe and Expedition. The price of these kits is expected to cost around INR 1.3 lakhs. By using these Hexa accessory kits customers can personalise their cars. 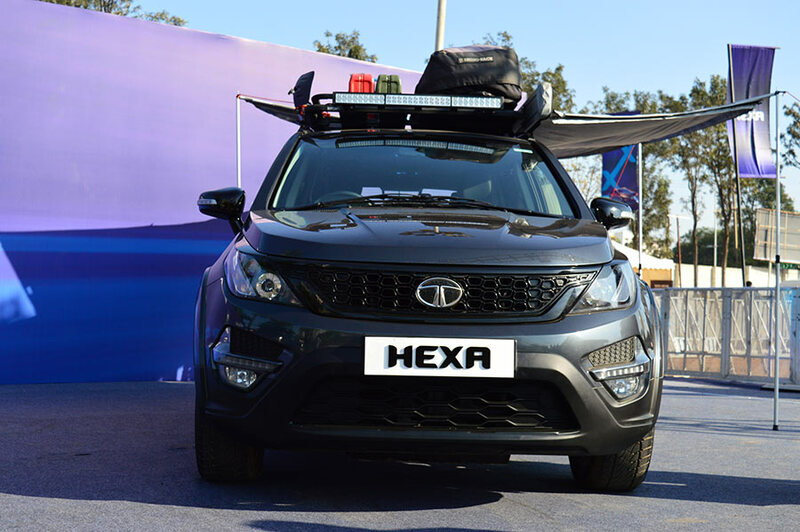 The Tuff customisation kit offered by Tata Hexa adds a rugged look to the car with accessories such as black plastic cladding on the side skirts, in the front, rear bumpers and a roof box. Inside, the Tuff kit gets an Heads up Display with TPMS, 3D-moulded floor mats and wireless charger. The Luxe kit in the offering enhances the premium quotient of Tata Hexa. Some of the additions include chrome garnish on grille, headlamps, ORVM caps, body side moulding, door handles and tailgate. The interior of Hexa will feature chiller and warmer box, wireless smartphone charger, anti skid floor mats, illuminated Tata logo on grille, and puddle lamps. Tata Hexa’s expedition kit is specially meant for travellers and adventurers. 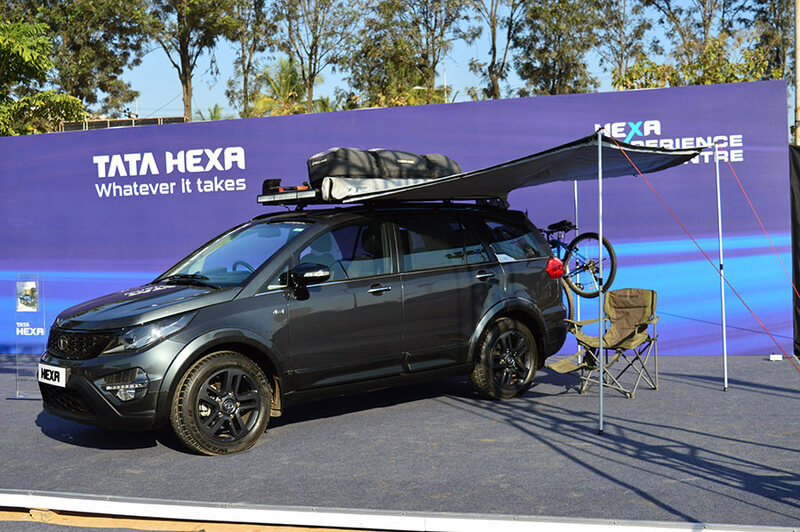 The expedition kit offered by Tata Hexa includes a canopy, puddle lamp, a shovel, waterproof luggage bag as well as 3D-moulded floor mats, and a roof platform. There are also individual accessories in the offering like 16 inch alloy wheels, sunroof, black leather upholstery, tyre repair kit, amplifier, subwoofer etc. Even before the official launch, we at GaadiKey did a experience drive of Hexa. You can read more about Tata Hexa Experience Drive here.